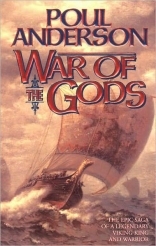 War of the Gods was written by Poul Anderson. War of the Gods was published by St. Martin's Press. A subject of War of the Gods is Science Fiction - General. About Poul Anderson (Author) : Poul Anderson is a published author of children's books and young adult books. Some of the published credits of Poul Anderson include Virgin Planet, War of the Gods, The Day of Their Return.